Due to overwhelming popularity registration is currently closed. We expect to reopen in the fall. Bring your users together like never before. Our Pro service offers new tools, customization and interactivity never before available. Once you are signed up answer a few questions at your covenience so our artists can get to work on your site. Link in to any social network so your content shows live whenever you update your status, tweet, write on your wall, etc. You can use the new calendar to integrate your existing schedule so everyone know's when you are available and when you aren't. Once you have your schedule down you can use the new chat room to come together as a group. The new gallery can be linked to from anywhere on your site and viewed without changing pages, so your users can browse specific groups of photos about related content. There is no 'right' combination. Use these new tools in conjuction with one another to maximize your effictiveness your way. Both on your own and as a team. We have several possible layouts of your site to choose from. Do you like a top or side menu? Wide or skinny content area? Fluid or static width? And these are just the ones we have come up with. If you need something different let us know and we will probably be able to make it happen. Ever stumbled on to a login screen that was just fantastic? Or maybe a news ticker that worked just the way it should? Point us at the it and if it's something we can replicate legally it will be on your site. With UnitNet 2.0 you add content by going into your Members Only secton or clicking an edit star. With UnitNet Pro you can do it right from the page you are editing. The new article system allows you to click a button to have an article added, removed or opened for editing. And it all happens without ever having to leave the page! When you are logged in to your Pro site you will see a link on every page call "Add New Item". When you click that you will get an editor similar to the one you currently see in 2.0 Members Only, but it will appear without having to leave the page. Once you are satisfied with your content (whether that is copy and pasted or wholly original) you just click save and the item gets dropped into your page. You no longer have to deal with extremely long home pages or muddle around looking for that one peice of outdated information. It is all clearly organized and can be pruned, or edited with the click of a button! You get 100% access to all pro services and tools, a customized website, and accompanying tech support. You also get 4 major edits per month. A major edit consists of adding or removing a tool or page. It could also be a photoedit, or mass upload for your gallery or document library. Most users will fall under this service package. With this service you get all the above plus 2 more major edits per month. With this service you get all the above plus another 2 more major edits per month. Finally a single billing solution for site maintainance! Pro is an official service provided by UnitNet, so there are no extra bills or third parties to deal with. Which also means there is no third party to whom you reveal your login. Remember UnitNet will NEVER ask for your password. Once you decide to go Pro we will have you answer a few questions at your convenience. This can be on the phone, over Skype, through email, texting, whatever is easiest for you. With the Pro services comes a whole slew of new posibilities for your website. One of them is an enhanced page editor. With the click of a button you can add or remove an 'Article' from your site. No more mucking about in the members only section. It's all right in front of you with no hassle. Don't worry. Part of your setup process will be a tutorial on the new tools. When you switch to Pro you should no longer need to use a third-party maintainance service. We will upload your newletter and provide additional content like sales ideas and fliers as well as some seasonal ideas. Remember official maintaince means official support and quality. When you call for service you won't get an answer that sounds vaguely like "not my fault" because UnitNet is both the service provider and the maintainer. In a case where a user does actually break something we maintain backups and will get you fixed asap! A side column menu layout with bright colors and a detailed top header. 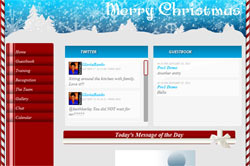 This theme also features a large background image to fill in the user's screen with a little holiday festivity. Note the twitter and gallery widgets on the home page. Click the image to visit. A very clean and easy to use site. This theme features a top menu and large footer which includes an embedded contact form so user's can shoot an email out directly from any page on the site.